PLAIN RECTANGULAR MARBLE TABLET WITH MOULDED FRAME. INSCRIPTION IN BLACK LETTERING. 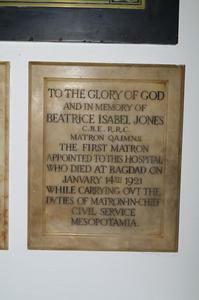 TO THE GLORY OF GOD/ AND IN MEMORY OF/ BEATRICE ISABEL JONES/ C.B.E. 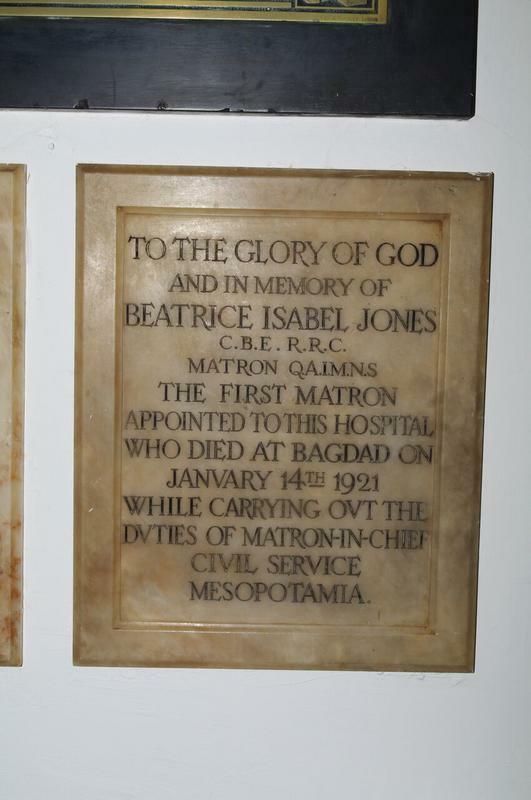 R.R.C/ MATRON Q.A.I.M.N.S./ THE FIRST MATRON/ APPOINTED TO THIS HOSPITAL/ WHO DIED AT BAGDAD (SIC) ON/ JANUARY 14TH 1921/ WHILE CARRYING OUT THE/ DUTIES OF MATRON-IN-CHIEF/ CIVIL SERVICE/ MESOPOTAMIA.